"	Although we take care to ensure the accuracy of information containing THE OFFICIAL LOTTERY OPERATOR results, we cannot take any responsibility for any mistakes or omissions. Prize winning and all aspects of the	THE OFFICIAL LOTTERY OPERATOR games are subject to the relevant Games Rules and Procedures.	" Do check your numbers with the 'Official Lottery Operators' before assuming that you have a winning ticket or not. The information contained in this site is for information and entertainment purposes only. Every care has been taken in its preparation and we do not make any warranties or representations as to its completeness, accuracy or reliability. New Zealand LOTTO NZ Draw: 1845, from MYLOTTO, mylotto.co.nz. draw 1845 on Wednesday, 10th April 2019 in New Zealand. The LOTTO NZ draw was transmitted live on TV. Draw Number 1845, was held on 2019-04-10, with following LOTTO NZ results:	17, 22, 31, 32, 33, 40, with Complimetary ball numbers: 06, and Powerball was 05, Total Winnings for this draw was: $1,159,592.00. -Each Winners' Lotto Result Prize: $662.00. -Each Winners' Lotto Result Prize: $33.00. -Each Winners' Lotto Result Prize: $24.00. New Zealand OZ Draw will be held on 2019-04-13. New Zealand OZ draw will be help on Saturday, 13th April 2019. Looking for the best online brokerage accounts for trading stocks, ETFs, mutual funds, and other investment vehicles? Different online brokerages vary widely in terms of the fees associated with each account, so we scoured the internet to find the best online brokers by category, whether you’re looking for a deep discount broker	(Ex. MoneyRain	), commission free ETF trading, or the best customer service. Based upon average ratings from individual forex traders collected world wide from numerous websites throughout the Internet we have a collection of top 100 online brokerages, that includes	MoneyRain, GlobalFutures, LiteForex, CMSForex, Forexcom, Fxsol, RealTrade, FxPro, ForexMart, Fxclub, BulBrokers, CortalCon,	and more. Lotto is our original Saturday night lottery game and the starting point for playing to win on both Wednesdays and Saturdays. You can choose to play Powerball and Strike too, however you must play Lotto first. You can play just Lotto, Lotto and Powerball, Lotto and Strike or all three games together. The aim of the games is to match the numbers on a line of your ticket to the winning numbers for that particular draw. Watch the draw when it's shown live every Wednesday at approximately 8.20pm and Saturday night at 8pm on TV One. Lotto costs 60 cents per line. If you’re picking your own numbers, you must choose a minimum of four lines, which will cost you $2.40. You can also play Dips, which range from $4.80 to $12 for Lotto. Strike costs $1 per line. You can add 1 to 20 lines of Strike to your Lotto ticket. Powerball costs 60 cents per line. If you’re picking your own numbers, you must choose a minimum of four lines of both Lotto and Powerball, which will cost you $4.80. You can also play Dips, which range from $9.60 to $24 for Lotto Powerball. If you like a bit more control, or have some favourite numbers you want to play, picking your own numbers is the way to go. Picking your own is super easy with our ticket builder. Simply use the number selector to pick six numbers between 1 and 40 to get one line of Lotto. You need to pick a minimum of four lines on a ticket and you can choose more if you’re feeling lucky! To play just Lotto, choose a Lucky Dip. There are four Lucky Dips priced from $4.80 (8 lines of Lotto) to $12 (20 lines of Lotto). The aim of Strike is to pick the first four Lotto numbers in the correct order – the more you pick in the right order, the more you win. To play Strike you need to pick four numbers between 1 and 40 and the order you think they will be drawn. For example, if you think number 23 will be the first number drawn on the night, pick that number first on your ticket. The aim of Powerball is to select the correct Powerball number that is drawn. You need to play Lotto in order to play Powerball. Powerball has its own numbers and a separate draw, which happens immediately after the Lotto draw. To play Powerball, simply pick one number from between 1 and 10 for each Lotto line on your ticket. Looking at your ticket, the Powerball number sits at the end of the Lotto line in its own special ‘Powerball’ column. You can choose to have the same Powerball number for all of your Lotto lines, or mix it up. You can pick your Powerball number(s) yourself or get a random selection. The choice is yours! Our Multidraw option lets you purchase your ticket for up to 10 draws, which makes it a handy option if you're heading away on holiday and won’t be able to get your ticket. Simply click on the Multidraw box when you’ve got your ticket selection sorted, and tell us how many weeks you want your ticket to run for. -Strike may not jackpot after the First division (Strike Four) has reached $800,000, or for more than nine consecutive weeks. In the instance that one of these situations occurs, a ‘Must Be Won’ draw will be called for the game concerned. Must Be Won draw means that if there are no First Division winners, the entire jackpot rolls down to the next division where there are winners. Each Wednesday night at approximately 8.20pm and Saturdays at 8pm on TV One, 6 Lotto numbers and 1 bonus number are drawn from a possible 40, and 1 Powerball number is drawn from a possible 10. The aim is to match as many numbers as you can – match a minimum of 3 Lotto numbers plus the bonus ball on one line and you’re a winner. Match all 6 main balls and you win Lotto – if you get the Powerball number too, you win the big one! 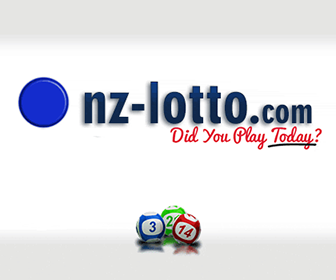 Lotto NZ is a Crown entity that operates nationwide lotteries in New Zealand. The oldest and most popular draw is the twice weekly Lotto draw which boasts a top prize pool of NZ$1 million. There are two other draws, the four-draws-daily Keno, and Bullseye, newly introduced Play 3, and a variety of scratchcards known as Instant Kiwi. Powerball and Lotto Strike are optional extras with every Lotto ticket, whilst the Winning Wheel game is free to all Lotto ticket purchasers. Instant Kiwi may only be played by persons 18 years of age or older, under the Gambling Act 2003. Profits from the publicly regulated lotteries are passed to the New Zealand Lottery Grants Board to distribute as funding for recreation, arts, community projects and sports. Since its creation, Lotto NZ has contributed more than $3.6 billion to the Lottery Grants Board. The New Zealand Film Commission, Creative New Zealand, and Sport New Zealand are major recipients of lottery money. NZ lotteries are subject to many regulations. The minimum age to purchase lottery products is 18. NZ-LOTTO.COM provides a wealth of statistical information, gathered by a team of highly skilled experts, for people who have an interest in lottery statistics and probability. This unique website provides in-depth numerical data for Australain Lotto. To provide the most up-to-date and accurate lotto statistics, the numerical information on NZ-LOTTO.COM is updated within minutes of the different lottery draws taking place and is thoroughly checked. To view information for a lottery, simply choose the option you like from below including the most common numbers, consecutive number patterns, distribution of odds versus evens and bell curve statistics. These pages shows you which NZLOTTO have been picked the most and least times. You can see which are the most common and least common LOTTO NZ winning numbers to drop out of the machine. EASY TO PLAY, WITH GREAT ODDS! Play 3 – a great new game that gives you the chance to win every day. Pick a three digit number and a play type. Match your number to the one we draw and you could be a winner! Play your numbers to win! Just pick a 3 digit number and a play type… Match your 3 digit number to the one we draw and you could be a winner!